First of all, I want to say a hundred thousand thank you's to all my new and returning customers who have supported my work in the last few months ~ I've sold out of almost everything! It's always a little terrifying to branch off and try new things, so I really appreciate your excitement over my new patterns, yarns, and upcycled clothing! Needless to say, I've been spending a lot of time at the post office and wasting a lot of money out of my own pocket on the USPS shipping supplies! I love that their durable cushion mailers made from 100% post consumer recovered material, but at $1.89 each, it's a hefty price to pay. EcoEnclose Poly Mailers claim to be as durable as their synthetic counterparts, with the added benefit of being completely biodegradable, compostable, and reusable. I've requested a free sample from their site and hope that their product lives up to it's promises! 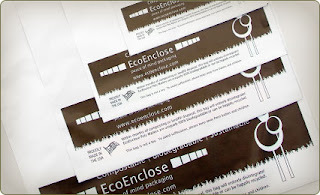 I'll keep you posted on how it works out, and I'd love to hear your recommendations for any affordable eco friendly mailers!